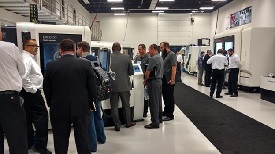 DMG MORI held open house events in eight (8) locations across the country in October. Autonetics attended the DMG MORI Open House in Charlotte October 26, 2016. A manufacturer of CNC-controlled Lathes and Milling machines, DMG MORI is a global leader in metal cutting, with advanced technologies in 5-axis milling or turn & mill machines for 6-sided complete machining. DMG MORI USA is headquartered in Chicago and has 28 Technology Centers nationwide.